The international community is allowing the rise of ISIS to distract it from the far more dangerous prospect of a nuclear Iran, Israeli Strategic Affairs Minister Yuval Steinitz warned Wednesday. The comments followed his visit last week to the United States, where he met with senior State Department figures William Burns and Wendy Sherman. "The Iranians are getting almost everything but giving almost nothing," Steinitz told a Jerusalem news conference in which he expressed his belief that Iran is being far from truthful in its ongoing P5+1 nuclear talks. "Although it is important to defeat ISIS [Islamic State], if Iran gets nuclear weapons, it's a different world for decades. This is the main threat to global security and should be the priority... I went [to Washington] concerned and I came back concerned," Steinitz added. "I didn't hear anything... that gave me hope." Senior Israeli military and intelligence figures have issued similar warnings in recent months, indicating that while Iran under President Hassan Rouhani offers the veneer of a more moderate regime, little has changed in Tehran. Ayatollah Ali Khamenei, Iran's firebrand supreme leader, still calls all the shots. 19. "Contrary to the relevant resolutions of the Board of Governors and the Security Council, Iran has not suspended all of its enrichment related activities in the declared facilities..."
49. "Iran is conducting a number of activities at UCF, EUPP, FMP and the Fuel Plate Fabrication Plant (FPFP) at Esfahan … which are in contravention of its obligations to suspend all enrichment related activities and heavy water related projects..."
62. "The Agency remains concerned about the possible existence in Iran of undisclosed nuclear related activities involving military related organizations, including activities related to the development of a nuclear payload for a missile." 67. "[A]t a particular location at the Parchin site, the Agency has observed through satellite imagery ongoing construction activity that appears to show the removal/replacement or refurbishment of the site's two main buildings' external wall structures ... These activities are likely to have further undermined the Agency's ability to conduct effective verification. It remains important for Iran to provide answers to the Agency's questions and access to the particular location in question." 75. "While the Agency continues to verify the non-diversion of declared nuclear material at the nuclear facilities and LOFs declared by Iran under its Safeguards Agreement, the Agency is not in a position to provide credible assurance about the absence of undeclared nuclear material and activities in Iran, and therefore to conclude that all nuclear material in Iran is in peaceful activities." Iranian failure to comply with the interim P5+1 deal struck last year by the U.S. and other leading nations should mark the end of negotiations, said Steinitz, one of Israeli Prime Minister Benjamin Netanyahu's closest allies. Allowing the talks to stumble along gives Iran the benefit of continued relief from international sanctions that dealt a crippling blow to the Iranian economy. "From our point of view, President Obama's very important principle and statement that 'no deal is better than a bad deal,' is by no means a failure," Steinitz said. "In a sense, it's a kind of success… It means standing up for your principles and not sacrificing global security." 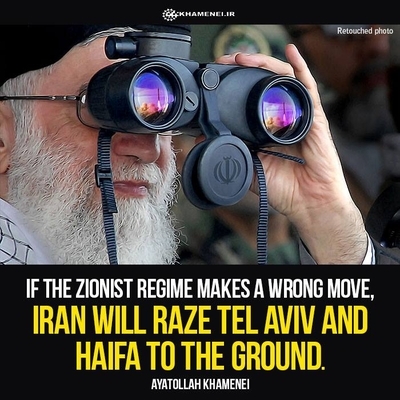 Israeli military officials share concern that Iran is threatens that security through its astonishing subterfuge and double-dealing – presenting a benign face to the world while continuing to support terror organizations such as Hamas in Gaza and Hizballah in southern Lebanon. In a recent exclusive interview, a senior Israeli naval officer (speaking to the IPT on condition of anonymity), outlined the extent to which Iran continues to try evading international efforts to stem its attempts to arm its proxy armies. "It is a war against this axis [Iran, Hamas, and Hizballah], and this war on the seas is continuing at the same time as these [P5+1] talks are going on," the navy official said. "I'm happy that these talks are going on because maybe, maybe, it's a channel to stop this madness. But at the same time, I know that I will not go back home and rest because of the talks. I will keep working." "[Iran] not only uses every possible way to pass on weapons, but they are also passing on information and instructions on how to produce weapons in Gaza. We know for sure that even if rockets and weapons reached Gaza tunnels via the Sinai deserts, they weren't produced in the Sinai desert. They probably arrived by the sea and came from Iran via the Red Sea ports, or Egypt – of course without the knowledge of Egypt itself." In recent years, the Israeli navy has intercepted huge Iranian arms shipments on vessels such as the Frankop (2009), the Victoria (2011), and earlier this year the Klos-C, whose cache of M-302 missiles, mortars, and masses of ammunition were hidden under its legitimate cement cargo. "We know for sure that ... weapons have passed through ports on ships that had no knowledge they were carrying this lethal cargo," the officer explained. "We know they are using containers that are transported from one ship to another, some of which sometimes stand for days or weeks out in the blazing sun waiting for a ship to take it. If one of these [unstable] containers blows up a lot of innocent people will get hurt. All the time Iran uses innocent people and they don't care how many of those innocent people get hurt, as long as they achieve their mission." "My men and ships are out there and we have been kept busy, not only with Iran, but with a lot of people who are not willing to accept the State of Israel. [Syrian dictator Bashar al-]Assad is a little more occupied now than in the past and I don't believe he has aspirations about war with Israel, but he will do whatever he can by using proxies such as Hizballah that will keep Israel and its army occupied." Continuing concerns over Iranian deception, together with the new threat posed to Middle Eastern stability posed by the swift rise of ISIS, have brought about an apparent change – if not in public, then seemingly in private – in alliances of convenience between states which formerly would have balked at the thought of working together, the senior officer said. "If someone in your neighborhood is slaughtering and torturing – like what happened to the American reporters – you understand that you will do everything for him not to be your neighbor," he said. "You will join hands with a neighbor with whom you may never have been friendly before to make sure the crazy neighbor won't do you any harm." "I won't go into specific details on cooperation" he adds, "but I will say for sure that every sane human being that is living around here just wants to have a family, a peaceful life, and a place of work. I hope that one day we will see this happen and ... I will go out with my flotilla and join hands with the Egyptian navy, Saudi Arabian navy, everyone around us, to make sure we will keep those people out of the Middle East." you got it in 1.He is the worst President in living memory. Alster's piece well explains Israel's justified concerns over the Obama led P5+1 interim agreement, voiced before the deal was signed and since. Predictions that lifting sanctions on Iran would only serve to strengthen Iran and commensurately weaken whatever leverage the West might otherwise have had on Iran to both enforce the P5+1 deal and ultimately force Iran to abandon her WMD agenda. Add to that while the P5+1 deal did not deal with Iran's terror sponsorship and hegemonic ambitions that also threatened Israel and the region, had Obama led the West to press its economic advantage by not just keeping sanctions, but threatening more if Iran did not abide by the P5+1 deal, the West would have been in a much better position to heavily influence Iran on those scores as well. Recent speeches by Obama and military witnesses at investigative hearings on ISIS makes clear that the reason Obama has no strategy to deal with ISIS is because he has rejected the advice of the Pentagon that U.S. ground troops must be part of the strategy if that strategy has any chance of destroying ISIS. Recent advice from former Sec. of State Clinton and former Def. Sec. Panetta reveal that they had counseled Obama to keep a force of about 25K in Iraq as the Pentagon recommended, but their advice too was rejected. As commander in chief, Obama does of course have the authority to over rule the advice of his experts in military and intelligence. One would hope that a president would have the wisdom and common sense to know that his advisers would have been chosen because they had greater knowledge and expertise in their fields of endeavor and their advice should be accorded the respect and consideration it deserves before rejecting same. One would expect of their president that if he rejects his advisers' advice, that he has good reason beyond his own political interests for so doing and can and does make his case to his electorate for his decisions . Sadly, America does not get that kind of president in Obama. His every decision is weighed and calculated not by objective realities, facts and best advice from his advisers, but according to what he perceives his own personal and political interests are and those of his party when those party interests happen to mesh with his own. Obama fails to make a compelling case for his obstinate refusal to take advice from his advisers and to respond to reality as opposed to shaping his decisions and policies based on what he wants reality to be which fits his ideology, world view and political biases. Obama fails in that regard because increasing numbers of Americans are coming out of their pro-Obama mesmerized fog and seeing that almost invariably Obama's policies fail domestically and on the world stage because Obama's efforts to shape reality to his own views are dashed by the very realities that Obama refuses to recognize and deal with.